The Japan Foundation Los Angeles, 5700 Wilshire Blvd., Suite 100 in Los Angeles, presents “Japanema,” high-quality Japanese film screenings, every second and fourth Wednesday at 7 p.m.
Aug. 10: “The Cross” (2016, 122 minutes), directed by Sho Igarashi. This film is based on the novel “Jyujika” by Kiyoshi Shigematsu, which won the 44th Yoshikawa Eiji Bungakusho in 2010. In the autumn of his second year of middle school, Shunsuke Fujii committed suicide. He left behind Yu, who was named as his close friend in his suicide letter, and Sayu, whose birthday fell on the same day he died. Shunsuke’s father was unable to forgive his classmates who knew about Shunsuke’s bullying but did nothing. And Shunsuke’s mother was still filled with pain as she clung to the memories of her son. Each of them will be confronting the weight of their own respective cross. Will they find forgiveness in the end? After 20 years, where will their lives lead them? Aug. 24: “Tsukiji Wonderland” (2016, 110 minutes), directed by Naotaro Endo. Los Angeles premiere. The Tsukiji Market, which is called the “Kitchen of Japan,” is the biggest wholesale seafood market in the world. It was built about 80 years ago and has attracted people throughout its rich history. Seafood from Tsukiji forms what is considered the backbone of washoku, or Japanese cuisine. 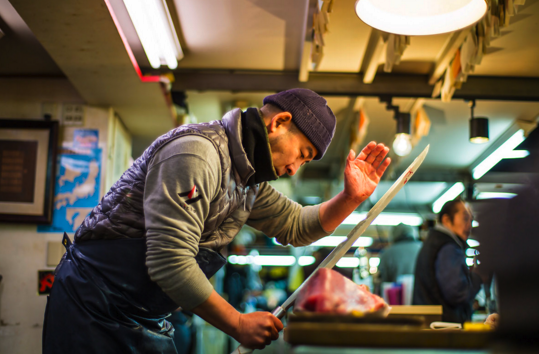 With an almost religious fervor, some of the country’s best chefs come to Tsukiji to sample the latest tasty and exotic morsels, plucked from the sea that morning. This film shows the passion of people in Tsukiji and the important essence of Japanese traditional cuisine through interviews with vendors, plus commentary from food celebrities such as multi-Michelin-star chefs Jiro Ono and Rene Redzepi. “Tsukiji Wonderland” is a sumptuous feast for sushi lovers everywhere and a rare glimpse of Japan’s ancient legacy. Films are in Japanese with English subtitles. Admission is free. Reservations not required. For street parking information, visit www.jflalc.org/about-us.html#parking. For more information on JFLA’s activities, call (323) 761-7510 or visit www.jflalc.org.